In honor of the one-year anniversary of the death of Butler basketball standout Andrew Smith, a Fund honoring his life has been created by the Indiana Family Institute. The campaign is titled 4-44 (Andrew's jersey number at Butler was 44). The four-year goal is to raise $440,000 (4-44). It has more than $200,000 in pledges toward the overall goal of $440,000. The Andrew Smith Center For Family Prosperity honors Smith's academic and family commitments. Smith was a four-year scholarship winner who played in two national championship NCAA Final Four games and was named an Academic All American prior to graduating in 2013. Smith developed lymphoma, a blood cancer, while playing professional basketball in Europe, a disease which he succumbed to on Jan. 12, 2016, in Indianapolis. "Andrew always said he loved God, his family and Butler basketball," his father, Curt Smith, said in making this announcement. "This honor highlights his commitment to family and a passion for numbers," his father added. "Perhaps we should add to the list that Andrew loved numbers," the elder Smith said. Smith was a finance major at Butler and was anticipating a career in business after his professional basketball play ended. The Andrew Smith Legacy Fund is the fourth public honor drawing on Andrew's inspirational life and battle with cancer. 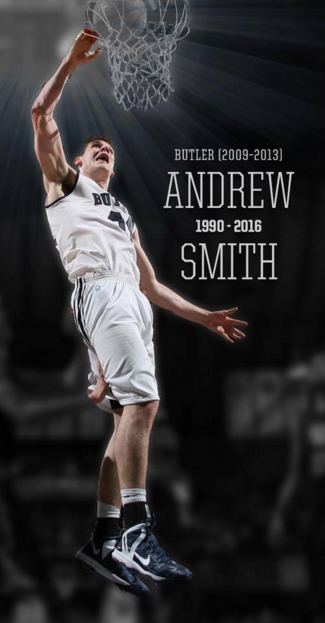 Butler University created a sports scholarship in Andrew's honor shortly after his death. Andrew and his widow, Samantha, supported Be The Match, a bone marrow registry seeking to expand options for blood cancer victims. A drive on two college campuses in December led to more than 200 new registrants. Finally, Andrew's high school, Covenant Christian on the west side of Indianapolis, dedicated its gym floor in Andrew's honor and retired his basketball jersey and number in December. The new center will focus on Indiana's fiscal, tax and budget priorities as part of the overall work of the Indiana Family Institute to provide policy analysis and advocacy for Hoosier families. Indiana's sound financial management during the past decade-plus has led to lower taxes, more jobs, efficient and frugal state government, and a bond rating higher than the US government. "Andrew was a fierce competitor, and I know from talks with him that translated to a commitment to free markets and competition," the elder Smith said. "This new Center and the activity it will sponsor perfectly blends Andrew's convictions about faith, family and free-market competition while focusing that effort on helping us retain the remarkable legacy of fiscal discipline and economic opportunity across the Hoosier State," Smith added. Serving as the Indiana partner with the American Conservative Union in publishing and highlighting the Family Prosperity Index, which provides a roadmap for federal, state, local and civic leaders and policy makers to improve the well-being and health of the Hoosier family. The index, which currently rates Indiana 28th among the 50 states, is published annually, and will be updated in March. The Center will be an in-state expert on the analysis and policy prescriptions this new national tool provides. Oppose tax increases for infrastructure projects before all options for user fees, sales tax reassignment, tolls, privatization, asset sales and other options are fully explored and exhausted. The Center will help policy makers explore and identify options so that a 10-cent per gallon new tax can be set aside in favor of more pro-family funding options. Static gasoline taxes are regressive and impact large and active families more than other taxpayers. Convene a monthly meeting for policy leaders to share ideas and find ways to grow family prosperity throughout Indiana. The initial Project 4-44 campaign for the Andrew Smith Center for Family Prosperity has as its goal to fund the Center's activities for four year and then determine if the work can be sustained beyond this initial campaign. The annual budget is $110,000, for a total of $440,000, of which more than $200,000 in pledges has already been secured. Would you like to support the Andrew Smith Center for Family Prosperity?